Those are the days over the past summer that I was lucky enough to spend here in the San Juan Islands helping spread the word on J5MM about how lovely these islands truly are. Hubby and B were even luckier. They vacationed here all summer and were always on time to pick me up at the ferry landing of whatever island we happened to be on. Our last island to spend time on was none other than Lopez. “Mommy do you remember when we made the forts on Spencer’s Spit?” B asks me this over dinner last night. Ahh, the summer of 2012 in the San Juan Islands. 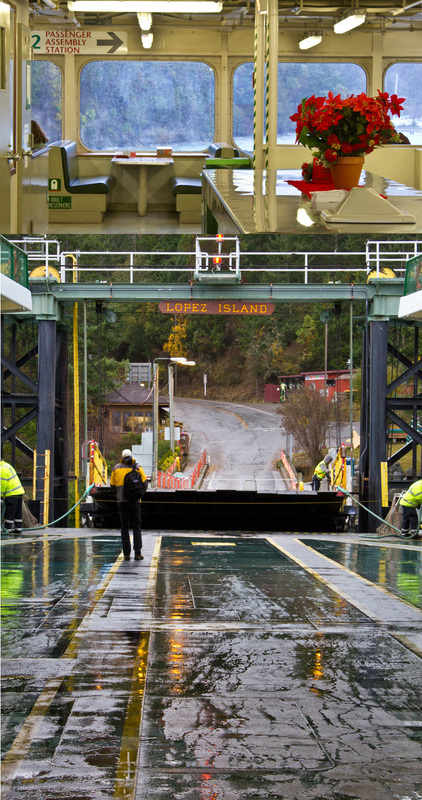 First Orcas Island, then San Juan Island and now we move forward to our last stop in these emerald green archipelagos: Lopez Island. Or should I call it as the locals so fondly do: SLOWPEZ. What a beautiful morning. The sun was rising like a brilliant gem in the sky lighting up our surrounding landscape with beautiful hues of yellow and orange. Breakfast this morning was a warm bowl of steel cut oats, to eat outside. I followed my recipe here and added 2 tablespoons of pumpkin pie filling while I was warming it up. I folded in a handful of white chocolate chips too. To finish off this decadent breakfast, I pulled out my brand new kitchen torch so I could melt or “Brulee,” some sugar on top. The result? 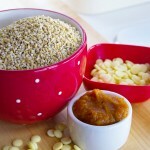 An amazing hard-shell candy top to a heavenly bowl of sweet and rich steel cut oats. To me? This was dessert. B must have felt the same. He devoured the entire bowl, and asked for more. Sometimes it’s nice to take life easy and enjoy the simple things. 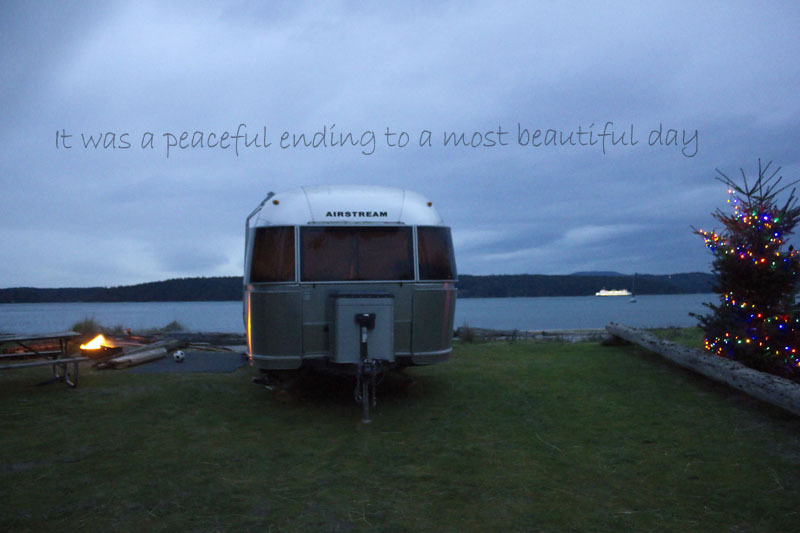 That was the theme for our Thanksgiving holiday weekend getaway in the San Juan Islands. Roast a simple turkey in the Airstream’s oven, enjoy some gourmet cheese along with a rustic loaf of bread and we’re set. Since we had plenty of leftovers it only made sense to pack them up in our picnic basket and go for a hike the following day. Our destination? Shark Reef Sanctuary on Lopez Island where we experienced magnificent sweeping views of the San Juan Channel and the Olympic Mountain range in the far distance. The weather seemed to be cooperating. It was rather chilly, but we were not worried, we had our blankets. Oh, and hot cocoa too. We finally found the perfect spot to enjoy roasted turkey with stilton cheese and cranberry chutney on “pillowy soft,” brioche buns. Honeycrisp apples to accompany the sweet creamy cheese (complete with flower). Buttery, rich pecan pie and hot cocoa completed our seaside picnic. Soon it was time to turn back and retreat to our warm and cozy Airstream where we would have our campfire (complete with s’mores) and light up the living Christmas tree. Watching the Washington State ferries pass by was such a pleasure . . .
Hubby, B and I awoke Thanksgiving morning to awe inspiring gale-force winds that literally shook the Airstream like a maple leaf being torn from its tree. 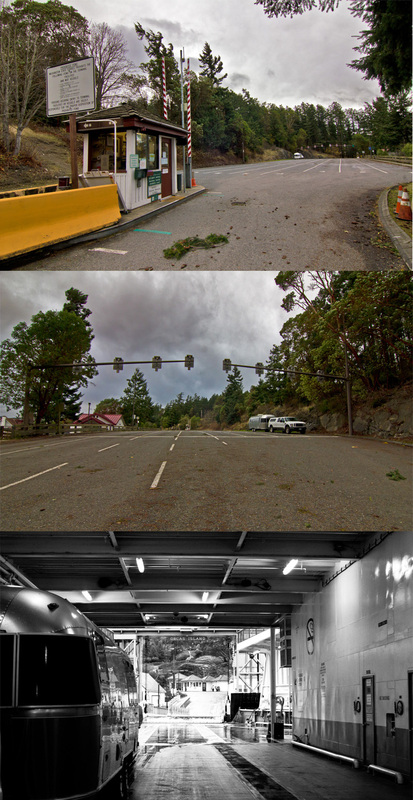 The Doe Bay Resort retreat tearfully was at a seasonal transition to winter destinations. We were both honored and grateful to be their guests for one of the most memorable times in our lives. I don’t think there is one particular highlight one can single out about Doe Bay. It is the synchronicity between all its moving parts. The spectacular coastline exposure, inspiring views, hot pools, sauna, yoga facilities and classes, the culinary artistry at the Cafe, and most importantly, its friends and family. We will miss you dearly, Doe Bay. Thank you for the incredible, life changing experience. Heaven on Earth this is. xoxo. We now slowly make our way back to the mainland. 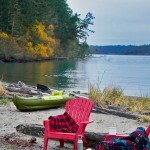 Our very last stop in the San Juan Islands is Lopez Island. Odlin County Park, to be specific. To celebrate Thanksgiving. A simple meal prepared on our Airstream. Just the three of us. Here we are in the Orcas Island ferry line on that stormy morning. What a peculiar sight! No one here but us . . . The ferry you see in the distance, stopped to enjoy the view of our Christmas tree and our silver, shiny Airstream as well, I am sure . . .
Wishing everyone a safe, happy and healthy holiday season.